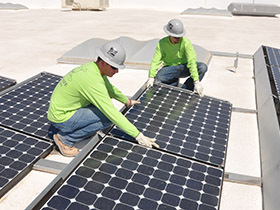 Wilson Electric Services Corp. offers feasibility consulting, design, installation, integration and service for any commercial solar requirement including design-build, retrofit, new construction and industrial. We work closely with our clients from the outset to explore design options that will best meet their specific goals. 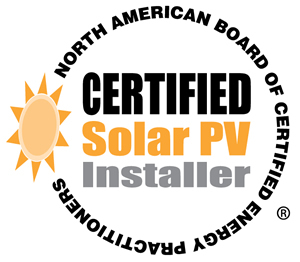 Our team of experts will guide your firm in selecting solar locations, equipment technologies and system designs that optimize financial and environmental performance. We offer the widest range of applications and products, including solutions for rooftops, parking lots and raw land. Our past projects include both fixed module installations, as well as tracking units that increase production by following the sun's movement. We've helped cities, counties, schools and private businesses, both small and large, take control of their energy costs and save for years to come. We have the experience to help you reduce energy use and save money. You can switch to solar with no upfront capital costs and start saving on electricity as soon as you turn on the power. With flexible financing and purchase options, saving energy is good business. Wilson Electric's Solar Division Manager, Mark Holohan, is a thirty-seven year veteran of the energy, engineering and construction industry. 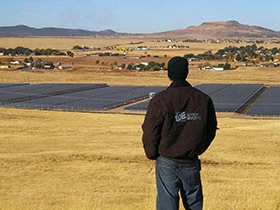 His experience includes well over 150 solar electric installations spanning nine states. 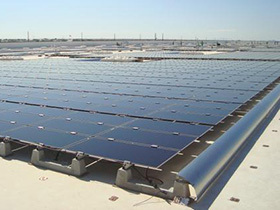 He developed several notable commercial projects in the expanding Arizona market, including: Phoenix Convention Center (the largest system in downtown Phoenix), Buckeye Hills Shooting Park (the largest off-grid system in Arizona) and Prudential Insurance (a one megawatt system with the largest solar canopy installation on a commercial office building in Arizona), and Washington Elementary School. Mr. Holohan holds an MBA from Arizona State University and an engineering degree from the University of Arizona. He serves as President of the Board of Directors for the Arizona Solar Energy Industry Association. Utility and tax incentives make now the best time for solar. Let us show you how to take advantage of these incentives. For a free feasibility consultation call Mark Holohan at 480-505-6559.